The Graduate Record Examination (GRE) is a standardised test that is accepted for graduate admissions at thousands of graduate and business schools across the world. After a major overhaul of the test itself in August 2011, the new pattern GRE lets you skip questions, change your answers and control which questions you want to tackle first. It is section-adaptive, so the performance on the first verbal and math sections determine the difficulty of the second sections presented to a test taker. What is the Syllabus and Structure of GRE? The GRE measures your verbal reasoning, quantitative reasoning, critical thinking, and analytical writing skills skills that have been developed over a long period of time and are not related to a specific field of study. Analyze and draw conclusions from discourse; reason from incomplete data; identify author's assumptions and/or perspective; understand multiple levels of meaning, such as literal, figurative, and author's intent. Select important points; distinguish relevant and major points from minor points; summarize text; understand the structure of a text. Understand the meanings of words, sentences, and entire texts; understand relationships among words and among concepts. The GRE is scored out of a total of 340 points, which include the Verbal & the Quant section. 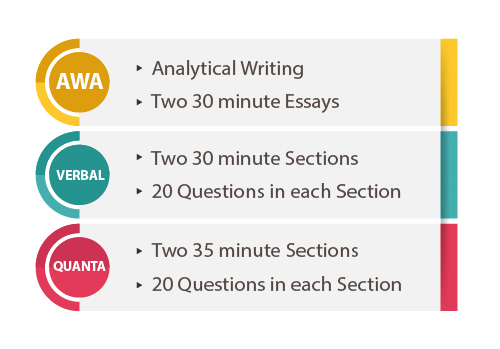 The analytical writing section is separately scored out of 6 points. Which countries accept GRE scores?